ONE DIAMOND PER ANNIVERSARY YEAR? HOW MANY DIAMONDS GO INTO AN ANNIVERSARY RING? For example, on an 8th wedding anniversary, they want 8 diamonds in the ring. Or 14th anniversary; 14 stones. That’s not how rings are designed (unless you custom design one). 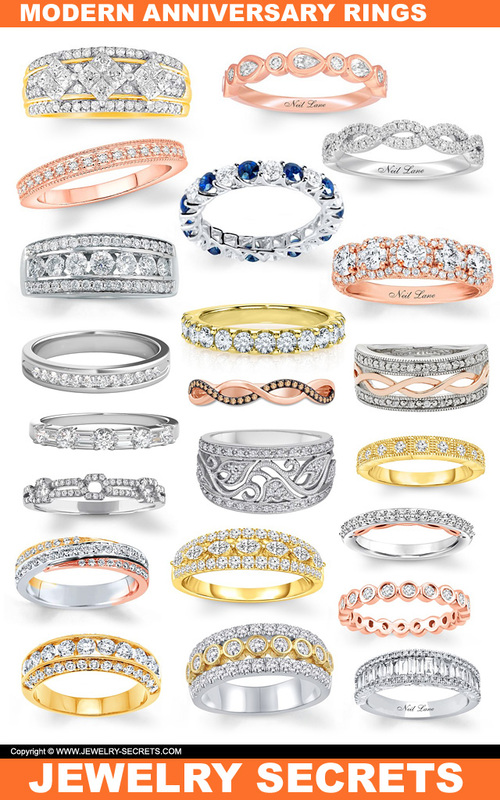 Most rings are created with style, rhythm, flow and design… not for an appropriate number of stones in mind. 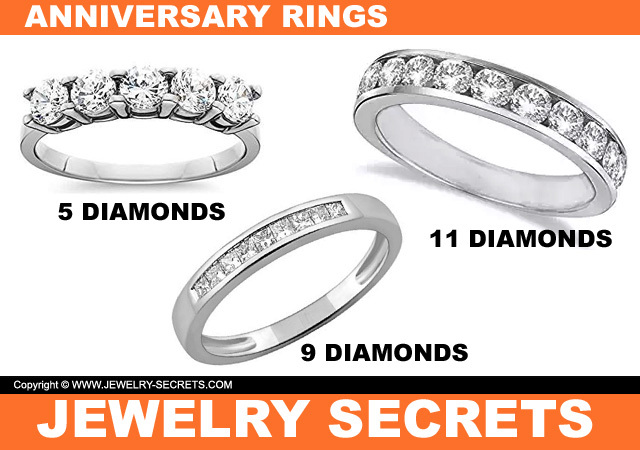 For if it was your 27th anniversary, you’d have a difficult task of finding one ring with exactly 27 diamonds. 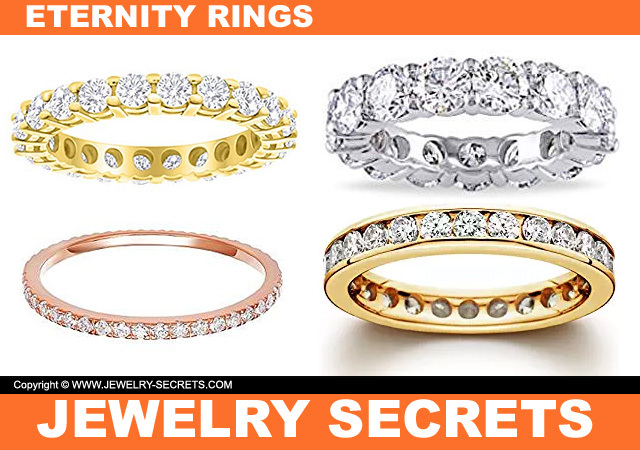 Eternity rings are different types of anniversary bands. With eternity rings the diamonds go all the way around the ring, in a never-ending row of diamonds (an eternity). The amount of diamonds and carat weight will vary depending on your ring size. A ring size 4.5 will only hold so many stones. 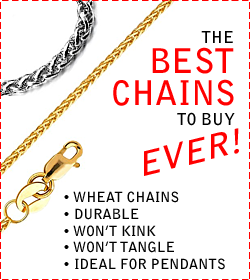 Whereas a ring size 11 will hold a ton more. All these styles are pretty common, smooth, sleek, balanced, and most can be worn up against your wedding rings (on the outside of your fingers-the wedding ring sits closest to the heart). And bigger, wider, elaborate anniversary rings can hold much more diamonds, channels, prong-set stones, flush settings, baskets… as well as other gemstones like Sapphire, Ruby, Emerald. So it’s not the number of years that gets the exact amount of diamonds… But it’s usually (traditionally) the year itself that gets the grand prize. The actual year (like 3rd, 7th, 21st…) dictates what that appropriate gift will be. Ivory, Gold Jewelry, Watches, Agate, Alexandrite, Bloodstone, Orchid, Opal, Emerald, Daffodil. Paper, Clocks, Watches, Gold Jewelry, Opal, Cat’s Eye, Peridot, Chrysoberyl, Carnation, Orange Blossom, Fresh Water Pearls, Mother of Pearl. Wood, Silverware, Sapphire, Daisy, Spinel, Turquoise, Pansies, Pink Tourmaline. Tin, Aluminum, Diamond, Leather, Watches, Jewelry, Emerald, Blue Sapphire, Onyx, Jade, Coral, Sweet Pea, Daffodil. Crystal, Watches, Diamond, Ruby, Rhodolite Garnet, Rose, Lily, Calla, Alexandrite. Platinum, China, Jade, Jewelry, Watches, Emerald, Aster, Yellow or Golden Diamond, Iris. Sterling Silver, Silver Jubilee, Yellow Rose, Tsavorite, Green Garnet, Iris. Golden Jubilee, Imperial/Golden Topaz, Yellow Roses, Violets, Red Rose. So whether you decide on 11 diamonds, 45, 125, or just going with Alexandrite instead, it’s all about style, design and bling. You can never go wrong with a ring ; the #1 gift for any anniversary, and you can never go wrong with diamonds. And do have yourself a happy anniversary!